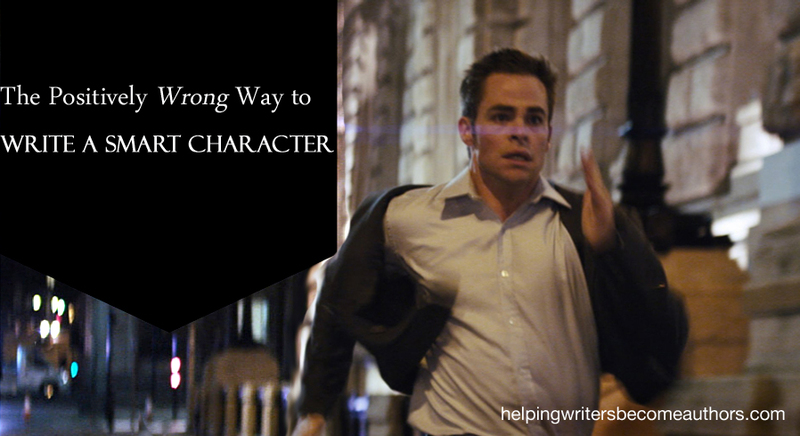 This week’s video offers examples from Kenneth Branagh’s Jack Ryan: Shadow Recruit to explain a common pitfall among authors who are trying to portray a smart character. With a few exceptions, I think we can all agree we’d really like to create protagonists whom our readers will perceive as smart. We want protags who are equipped or at least have the capacity to grow into being equipped to handle whatever the story may throw at them. Brawn may be seriously important in some stories—but brains will always be important. But sometimes we can struggle with how to portray our characters’ intelligence. Today, I want to talk about one possible technique that you actually do not want to use to make your protagonist look smart. And that is simply this: Don’t create an impressive contrast between your protagonist’s IQ and that of the characters around him by reducing the intelligence quotient of the supporting characters. It’s possible this approach might make your protagonist look like a genius. But, more than likely, it’s only going to end up making him look like an average Joe in the presence of idiots. Kenneth Branagh’s Jack Ryan: Shadow Recruit offers a really good example. When the action starts heating up in the Third Act, newly recruited CIA agent Jack gets his chance to show his stuff as he goes brain to brain with the evil Russian mastermind. So far, so good. He is a smart character, and we believe he has the brainpower to do the job. In fact, we might even reasonably believe he is one of the smartest people in the agency. But what we definitely don’t believe is that the rest of the agents are idiots who don’t have a clue. Branagh tries to impress us with Jack’s smarts by having him literally take over the mission and leave even his experienced handler gaping in amazement as Jack makes relatively obvious assumptions about the bad guy’s plans. We certainly don’t end the scene by doubting Jack’s brains, but neither are we astounded by them, since he’s obviously surrounded by a bunch of incompetents, who somehow, miraculously, ended up in the Central Intelligence Agency. Tell me your opinion: How have you shown readers that your protagonist is a smart character? When I’m creating characters, even villains, I never even turn my mind to the really bright ones, and perhaps that’s a mistake. I guess I assume that those who need a certain level of intelligence will have that level almost automatically, and that the reader will figure that out by the actions those characters take during the story. I have turned my mind to a character who is not particularly intelligent, e.g., a low-level criminal who gets duped or misled by a higher level criminal. The low-level criminal has a moral compass that the villain doesn’t, although the villain does have a few redeeming qualities. The low-level guy, in dramatic terms, is a foil to the high-level criminal. I’ve created characters who think they’re smarter than they are, but that’s more about arrogance and other personality traits. In my current WIP, I have a young character (18 years old) who has a lower level of intelligence due to suffering from fetal alcohol syndrome, and she gets into serious trouble because she cannot understand the relationship between cause and effect. I know some real-life people who are similar, and I’m using them to try to get her voice and thought processes right. I’ll be getting the opinion of some of these real-life people, although due to their lower level of intelligence, it may well be that their opinions won’t be of much value, but the process of soliciting their opinions may well teach me more of what I need to know to be able to create a realistic character. Plus I’ll get her scenes reviewed by experts who deal with such people. Over time in dealing with people, I’ll eventually decide whether someone is intelligent, but for me, intelligence has more to do with how a person makes decisions (whether or not those decisions have had good results since life is often a lottery), not how well they speak, their level of formal education or social class, or how well they perform on tests, etc. I read somewhere, years ago, that a too-smart character may turn out to be unlikeable if you’re not careful. No one likes a show-off, for example. The Jack Ryan example demonstrates, perhaps, that the ordinary reader will accept levels of writing and characterization that are lower than laudable levels in terms of the writing craft…which doesn’t mean that we shouldn’t strive to reach the highest level possible. Your method of using other characters’ opinions to bolster the reader’s view of the protag’s intelligence is great. As long as the story is offering proof to validate the supporting characters’ views, this is a great and surprisingly subtle way to reinforce character traits. I think really smart characters are hard to represent because they can come across stuck up with a holier than though attitude. I think it is important to humanize them, but again that is difficult without dumbing them down. And creating a genius character without dumbing down the surrounding cast is again a challenge, because how else do you show the gap of intelligence you strive for? I’ve never written a genius character and I’m not sure I would know how since I don’t have a lot of examples to draw from. I’ve never been a Sherlock Holmes fan because of his oddities and peculiarities. The only super smart character I can think of is Encyclopedia Brown. He seemed like a genius to me (at the tender age of ten) because I could never figure out the mysteries and he always knew the right answer! The trick to writing smart characters is two-fold: 1) *we* have to be smart enough to write them convincingly, and 2) we have to find a balance of believable lapses in the supporting characters’ logic, so they can bow to the protag’s niche knowledge without needing to be overall dumbos themselves. A recent villain I wrote was intended to be a genius. I revealed this through his perspectives and interests. He wasn’t content with the mundane aspects of life. Rather, he enjoyed philosophy, literature, and music. He relished debating with the heroine, and while he wanted to win, he enjoyed the moments when she outmaneuvered him purely for the intellectual stimulation. Some of his talents also supported his intelligence. He could quote texts and had an ear for perfect pitch. But his real genius came in his ability to predict others’ behavior based on his observations of them and then to manipulate people against each other. However, every intelligent person I’ve known has flaws, and I gave this villain flaws I’ve seen in real life. As cerebral as he was, he missed some of the normal concerns of life and so sometimes underestimated people. Or he would over think things so much that he’d fail to connect a pair of really crucial dots, a few of which lead to his downfall. He had a tendency to dismiss those he considered unintelligent, and so he was surprised when they turned against him. I think part of writing an intelligent character is making sure he doesn’t turn into a Mary Sue. Even incredibly intelligent people have flaws and make mistakes. Sometimes their intelligence leads to their mistakes. Intelligence does not equate to perfection. Also, while a character can be brilliant in one area, he shouldn’t be in all areas. For example, Holmes was a genius when it came to logic, reasoning, and all sorts of stuff for solving mysteries. But he fell far short of being brilliant when it came to social delicacies, especially emotional ones. That’s why Dr. Watson was so necessary and pleasant. One that drives me crazy, though, is when an author talks down to readers through the intelligence of a character. That’ll pretty much ensure I put down the book forever. Before I got to the end of your comment, I was already thinking of Sherlock. He’s a fabulous example of a crazy genius guy who’s still entirely relatable thanks to the areas in which he’s *not* a genius. I’m writing a very intelligent hero right now. He’s a bit arrogant about it too, so I’m focusing on him learning the value of humility. He’s also right in the middle of realizing how stupid he’s been in the way he’s treated the woman he loves, and trying to make himself see things from her perspective. He’s surrounded by people who are just as smart as him, and I’m NOT making the featured mistake. Every situation I’m putting him in forces him to grow and let go of his long-held beliefs that other people always find fault with him and it’s better he push them away before they have a chance to abandon him. The great thing about *not* dumbing down surrounding characters is that it challenges the protagonist and forces him to get smarter, rather than stay complacent. Challenges us too! Another bad way to show how smart your character is is to come right out and say it. I immediately stop reading a thriller that opens with a description of the character that tells me they sailed through school with perfect grades and graduated first in their class from university, med school, or whenever. Seriously? Can’t manage to work that into some detail or bit of dialogue? Ugh. Agree. Not only is that often bad writing (telling), but it also ups the ante by putting the reader in a “prove it” mindset. If the character then comes up short, readers will be disgusted. What does annoy me is when smart characters are defined by their intelligence. In certain films and books, all the smart characters ever do is rant about the proper usage of ‘whom’ or why a certain chemical is particularly interesting. Really? Agh. Grammar nazis. I love grammar as much as the best of them. But please no. Definitely. Too many authors forget that intelligence doesn’t mean a character has to use correct grammar or sounds smart in his style of speech. I know someone who teaches high school, and he says that some of his most brilliant students don’t use “correct” English. It all boils down to narrative expedience. Discarding reality elsewhere so as to ‘big up’ and help define the desired reality of the protagonist, however lazy. The more intelligent the storyteller, the then more intelligent the story/story character – that’s honestly it. It’s an issue that exists all in the beginning: have you had the intelligence to not contrive? Have you had the intelligence to plan, and not just assume that you can start joining the dots later on? Etc etc. Definitely hard to write characters who are smarter than we are! Their context in the story. It may well be that our character is more intelligent than we are, yet we can write them because our depiction of them in the story we’re writing doesn’t exceed us. Most of my Antag.’s are super smart. I don’t particularly like dumb Antag.’s in major novels like I write. They aren’t kids books. I need baddies to be intelligent in my novels to make them work properly! Yes, I LOVE Team Rocket-type Antag.’s for kids books, they are funny as well as the bad guy. They steal things like socks, and buy things like faulty hot-air balloons! But in all seriousness, they aren’t realistic!!! Frozen even has a realistic villain! (I won’t say who for those who haven’t watched it) He has real motives (albeit stupid ones) and NO way to fulfill them except by his plan to kill Elsa. Red Skull in Captain America, Dilaf in Elantris, The Lord Ruler in Mistborn, Lord Voldemort in Harry Potter, and Sauron in Lord of the Rings all have three similarities. #1, They have some awesome brainpower! #2, They are all a bit mentally unstable (to varying degrees) and #3, They want to destroy the world as we know it. Besides, smart villains are just that much more plot-driving! Totally agree. There’s a reason so many classic bad guys are the INTJ/Mastermind personality type (which isn’t to say INTJs are all geniuses; I’m an INTJ and I couldn’t rule the world if I tried :p ). Oh, I’m sure you could if you tried; it’s just that you’re writing all the time. This summarizes Maze Runner in a little over 2 minute segment. Ah, really? That’s disappointing. I haven’t seen it yet. Not the film, the book. I was quite pleased with the movie, though there were some definite holes. Ah, gotcha. I haven’t read the book. I have tried. The heroine is a biomedical expert, so she has to be ‘smart’ at some level. But I have made her weak in others, just to make her more ‘human’. However, she possesses a ‘hidden talent’ during a time of crisis, which she is even surprised about. I hope it works. Larger-than-life characters need larger-than-life flaws. Works every time. I like Laura Lee Nutt’s idea about showing the flaws of the brilliant characters. I have a WIP in which a character is smart, but she was raised by mythical creatures and has no idea how to navigate amongst humans. So, when it comes to cerebral activities she’s smart, but for social rules she’s mystified. I use her upbringing as a worldbuilding tool. It’s absolutely important to show that the character is smart within their *domain* of knowledge. A good model is the show Leverage — one character was a master thief, but she was poorly socialized as a child, enough so that she was on thin ice whenever she had to interact with other people. One character was a master grifter who could “hack” a security *guard,* but if you needed to hack a security *system* you turned to the team’s computer whiz. Another character could do none of these things, but he could go hand-to-hand with the bad guys and get his team out of tough spots that way. The centerpiece was the “mastermind,” who could see the whole chessboard and direct events and people as though they were game pieces. If you don’t want your smart character to come across as an insufferable know-it-all, make sure they know their limitations, and show them turning to other domain experts as needed. Another example is the cheesy Captain Planet cartoon. Four of the members had cool powers: “fire, earth, wind, air,” but a fifth character had the lame “heart” power. However, with “heart” they could summon Captain Planet to take down the bad guys. The genius character is going to be “the heart” in the group. They will tie the power team together, see the bigger picture and take down the bad guys (or whatever their mission is). Great point. No one is smart in all aspects of life. Showing otherwise brilliant people making stupid mistakes in certain areas of their lives only makes them more relatable and, sometimes, lovable. My protagonist in my latest book has Asperger’s Syndrome and a related condition called DAMP. This means that the protag is fairly intelligent but is seem as dumb by his classmates. One example is that he never quite grasps the concept of percentages in math, thus confirming his classmates opinion of him. However, negative numbers come to him like second nature but when he gets 98% on the test, his classmates accuse him of cheating. The perceived lack of intelligence of the protagonist is the reason why no one expects that he could have come up with the plan to shoot up his school. Juxtapositions like that are always hugely interesting to explore. I always assume all my characters are intelligent. Then there is the one who is more intuitive, the one who is more witty, the one who sees connection between things more easily, the one who knows more things then most people, the one who knows a lot of things about one particular subject, the one who gets the workings of relationships with people right away. Some characters have more than one of this treats, some just have one. Being able to offer people routes of escape, ending their reality of being confined to an otherwise never-ending pattern of life – another form of intelligence. Very true. Context is everything. Certainly, at times, they looked at a complete loss, but to me that illustrated the limitations of their training/methodology (which worked most of the time on most lesser crimes) And because they tried to apply a standard model to an unusual/extraordinary crime, they ended up reaching the wrong conclusions – usually the one(s) the mastermind would want them to make – whereas she would stand back at the periphery, so to speak, observing how the pieces fit together in their own way… what fit, what didn’t fit; and by that discover the truth. Good example. After all, there *has* to be a reason why a little old lady is better at solving certain mysteries than the professionals. Exactly. And lends itself to additional character development for those detectives who learn to admire her ability… and those who it rubs entirely the wrong way. I wandered by to leave a remark on your post because I think it’s an excellent point, but I’ll admit I’m a touch dismayed at some of the comments (after scrolling down to get to the comment box). As a biomedical scientist with a PhD, I am someone who works with highly intelligent people every single day: PhDs, MDs, graduate students, and so forth. We are actual people. We don’t need to have flaws ‘written in’. We have them automatically. We are real people with real traits. Our fictional selves? Also real people. Smart characters don’t have to be written as larger than life. They certainly don’t have to be snobby and obnoxious, either. I do, as it happens, have a number of very congenial discussions with a colleague on a regular basis about what might be termed ‘grammar nazi’ topics – but none of it is to make ourselves seem Super Extra Smart or better than anyone else. We simply happen to appreciate the English language and enjoy talking about some of the various uses of language that come up in various places. Being intelligent doesn’t make someone an insufferable know-it-all. It doesn’t make someone socially inept, lacking in friends or connections, or devoid of personal interests and hobbies. Plainly put – there are a plethora of intensely poorly written intelligent characters out there, and I suspect that it’s these characters upon whom a number of subsequent writers then base their own – not the characteristics of real people. It’s dismaying and disappointing, and it doesn’t reflect the vibrant, interesting, and non-smug members of the intelligentsia with whom I interact on a daily basis. If someone’s going to be a smug know-it-all, that’s a character flaw they could possess regardless of their various characteristics – not something inherent about intelligence. The idea of a snobby intelligentsia has become something of a stereotype and, particularly as such, is something most of us need to avoid stringently. Verisimilitude is always the goal, no matter what type of person we’re trying to portray. But super-intelligent characters often *will* be larger-than-life characters, simply because *most* great skills become larger-than-life within the context of fiction. As far as that goes, larger-than-life virtues and skills always need to be balanced with appropriate (and hopefully realistic) larger-than-life flaws as well. The protag in my WIP has an extremely high IQ but is emotionally immature (partly as a result of how smart he is). His genius helps him create something profound and transformative, but his emotional immaturity leads him to do something with his creation that has disastrous consequences. Dichotomies like that are always rich ground for interesting story scenarios.